This is correspondence sent and received by Mary Evelyn Dobbs, corresponding secretary of the Kansas Woman's Christian Temperance Union from 1907 to 1939. The letters arrived from people across the state, including the presidents of county chapters of the KWCTU. Most correspondence relates to planned public speeches and visits intended to establish and support new branches of the KWCTU. There are also communications from the state organization to local units. Specific items include a letter dated July 1, 1918, from Dobbs to F.L. 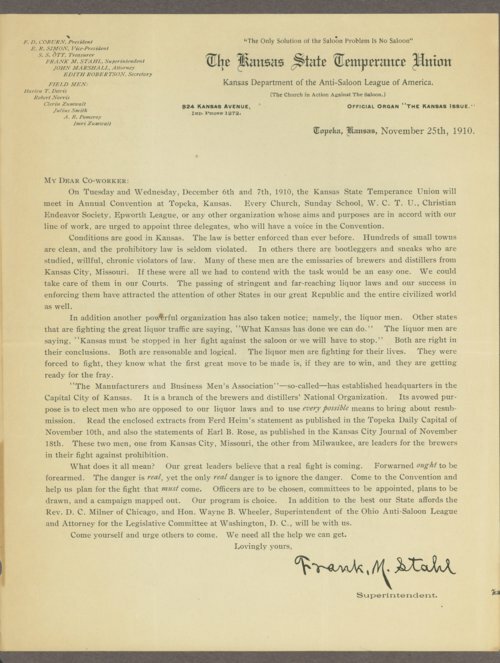 Pinet with a manuscript entitled "Early Factors in Kansas Prohibition" intended for publication in the Kansas Teacher, advertising contracts for the KWCTU periodical Our Messenger, and a letter written to Dobbs from Clara E. Keys, a WCTU missionary in Africa. One letter recognizes Mary Sibbitt as the organizer of comfort kits provided for soldiers at Fort Leavenworth. Sibbitt, known as the "Kansas Cyclone," was an founding officer of the International Association of Women Ministers. There are several other groups of official Kansas WCTU records on Kansas Memory. They can be found by selecting Collections - Manuscript - KWCTU/Mary Evelyn Dobbs.